1. Thank you to all the Veterans, even though I am a day late. Yesterday my daughter and I met the sweetest old man at the post office. He was a vet, as indicated by his cap, and I thanked him while I teared up at the thought of mine and s brother, off to Afghanistan for a year :(. Anyway, the man told me he served in WW1 and WW2 and I later realized for that to be possible he had to have been around 106 years old. Funny, when my daughter asked how old the man was, I had guessed around 70. 2. My kids already have their Christmas wish lists finished, thanks to Target, Wal-Mart, and Toys R Us catalogs. I remember when I was little, waiting and waiting for the Sears catalog to come out. Pages and pages of a toy-lovers dream. 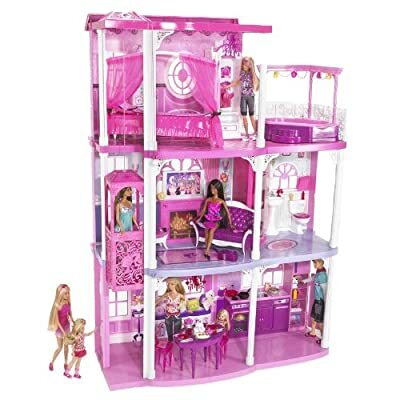 One of my favorite toys was the Barbie Dream Townhouse, and now it’s back! Looks like the only thing that changed are the colors. The elevator in mine was yellow and the interior was decorated by all those brown hues from the seventies. Ahh, memories. My daughter is asking for the Barbie house this year, but holy cow, so expensive! 3. I’m so happy to see the holiday cups at Starbucks! Two months of Christmas is really bad, but I love it! 4. The first draft of my WIP is almost done! I am aiming to finish by Thanksgiving when the holidays really take over. I only stopped writing today because my wrists and hands hurt. Hi Shannon, haven’t heard from you in a while. I love those cheery Starbucks cups too. Have your kids seen the Barbie jet? Fancy. :p Have a great weekend!